Of the roughly $9 million UB Athletics collects from a student athletic fee, 92 percent goes toward servicing the Division I varsity programs and its 535 student-athletes, and just 8 percent goes toward servicing the recreation services available to all 30,000 students. Marcus Hutchins, who worked for UB recreation for 16 years, recently visited SUNY College at Brockport’s $44 million, 138,000-square-foot student recreation center and had one thought: How can UB not have this? The center opened in 2012 and includes a state-of-the-art fitness center, weight room, 200-meter running track and courts for basketball, volleyball, badminton, tennis and soccer. UB – unlike some of its fellow SUNY schools and all of its athletic conference rivals – has no standalone recreation center for its 30,000 students. Instead, the university crams the majority of its recreation services, like fitness and intramural sports, into Alumni Arena, which also houses its Division I varsity programs, and into Clark Hall, a nearly 80-year-old rec building on South Campus. UB is one of a fraction of universities that does not separate its Division I athletics program and its on-campus recreation into two departments, and lets the athletics department decide how much of the $9 million student athletic fee goes toward D-I athletics and how much goes toward recreation programs. UB does not have a recreation fee. This past year, the breakdown was simple: 92 percent of the student fee went to the D-I athletics programs, while 8 percent went to recreation services, according to UB’s comprehensive fee website and the athletic department’s 2014-15 athletic fee expenditures. The money breaks down like this: Recreation services, which are available for all 30,000 students, got $712,069, or $23 per student. The D-I athletics programs, which have 535 student-athletes, got roughly $8.4 million, or $15,700 per player. The football program alone received $1,130,140 from student fees. And while last school year the athletic department had a $32.1 million budget, which was close to 70 percent subsidized by student fees and direct university support, recreation and intramurals operated with just a $1.8 million budget. Students insist the numbers tell the story. Clearly, they say, recreation is not a priority for UB Athletics, which has pushed to improve the national exposure of its 20 Division I varsity sports. UB Athletic Director Allen Greene admits UB’s recreation facilities are inadequate and less sophisticated than those at other SUNY schools. He also acknowledges UB needs a standalone student recreation center. But he insists UB Athletics has done what it can to fund recreation with the lowest athletic fee among the four SUNY university centers and without a standalone rec fee. Students say the current athletics and recreation model simply doesn’t work. They say there’s not enough fitness equipment and space for students looking for a workout, nor enough courts and fields to accommodate UB’s 32 club teams and 19 intramural sport leagues. They say UB’s main recreational field, Kunz Stadium, has an inadequate turf that is patched with duct tape and leads to dozens of ankle sprains. Club teams also question the athletics department’s policy of charging additional usage fees when every undergraduate already pays the athletic fee of $267.25 per semester. Athletics charges clubs $54 for an hour in the pool and will implement new fees next year for teams hosting games and tournaments on athletics-owned fields. Students have begun to push back. The executive board of the Student Association, UB’s student government that funds 32 sport club teams, has formally proposed that UB separate recreation services from UB Athletics and house it under Student Affairs, as most universities do. The board proposes a lowered $240.35 athletic fee, and a new $158 recreation fee that it said would allow Student Affairs to build a standalone recreation facility on campus while also improving existing facilities. UB is in talks with SUNY to split the fee, and the SUNY Chancellor will make a final decision this summer. UB’s recreation dilemma highlights the burden heavily subsidized college athletics can have on other areas of campuses like student recreation, and shows the conflict that can come about when a Division I athletic department has to directly compete for funding and space with student recreation. Even if SUNY approves the creation of a UB recreation fee, which many expect it to, recreation will still be under the control of athletics. SA President Minahil Khan, who worked with her fellow board members Sean Kaczmarek and Joe Pace to propose a split fee, worries this model will never work, as UB Athletics will always have to prioritize athletics over recreation. She questions why UB, considered the flagship of SUNY, is unable to have adequate recreation for its students. Students say recreation is a major part of the university experience and adequate recreation services should come standard with a tuition bill. A 2013 survey of more than 33,000 college students conducted by NIRSA, formerly known as the National Intramural-Recreational Sports Association, found that 75 percent of college students use their on-campus recreational facilities, programs and services. The study found benefits, with high percentages of students saying recreation improved things like their personal well-being, stress management and concentration. It also found that recreation impacted student recruiting and retention, with 68 percent of students saying a campuses’ recreational facility influenced their decision of where to attend college, and 74 percent saying it influenced their decisions to continue attending that college. Some universities have taken notice. Stony Brook, a SUNY university center like UB, spent $37.5 million in 2012 to create an 85,000-square-foot recreation center. UB’s fellow Mid-American Conference universities have also invested in their recreational facilities, with Ball State opening a $40 million rec center in 2010 and Bowling Green spending $14.8 million to upgrade its rec center in 2014. And students have proven they’d be willing to pay for such a facility at UB. UB worked with a consultant to determine student support for a standalone recreation center in 2002 and 2013 – with 72 percent of students in the latest survey saying they’d pay a $129 to $165 recreation fee per semester to fund recreational enhancements at UB. “If I’m going to college already and I’m taking out loans to go here, if I have to pay another $150 a semester for recreation, granted I’m biased because I use recreation, people aren’t even going to notice that,” said John Grasso, a junior engineering major and member of UB’s men’s rugby club team. UB has made some improvements to Clark Hall in recent years, like renovations to its pool and bringing in new equipment for its fitness center, as well as opening a team store in Alumni Arena to generate recreation revenue. But students say minor fixes are not enough. They say a standalone recreation center is needed. So, if students want and are willing to pay for a recreation facility, why hasn’t it happened yet? The UB men’s rugby club team does more than what some might expect a club to do. Two years ago the team moved into the Rugby East Conference of DI-A College Rugby, and plays against varsity programs like Army West Point and Wheeling Jesuit. SA sports club teams, like men’s rugby and lacrosse that play at the national level, say they’re held back by the state of recreation on campus. The tension was visible, audible and all in one room back in February, as approximately 70 students, mostly SA sport club members, expressed their frustrations with a panel of four athletics administrators in an open forum. One of students’ main complaints was the lack of space in Alumni Arena, as clubs, intramurals, varsity teams – and sometimes even the basketball teams’ opponents – vie for space in Alumni Arena’s main court and Triple Gym. In Alumni Arena’s main gym, clubs and intramurals must practice on the floor space surrounding the court, as they’re not allowed on the men’s and women’s basketball team’s court. The men’s lacrosse club said lack of practice time and practice time being moved around by athletics directly affected their preparation and performance this season. When it comes to UB’s two turf fields, students have major issues with one – Kunz Stadium, which they say has turf that is inadequate and sometimes, unsafe. UB’s other turf field is the football team’s in UB Stadium. UB Athletics funded a patch up of Kunz’s turf, but students say it hasn't been enough. Truesdell said she’s seen 30 to 40 student ankle sprains on the turf during her two years in SA, and that the problem became so bad she almost began emailing former UB Athletic Director Danny White every time there was an injury. “Ankle sprains left and right,” Truesdell said. UB Athletics spent $1 million to redo its football stadium field turf after it was damaged by a winter storm in 2014. Clubs are also worried about additional fees. UB Athletics charged the water polo club $54 an hour to use the Alumni Arena pool outside of the normal rec swim time,as well as the $30 an hour it must pay for lifeguards. Despite student push back, those fees will increase next year, as the rate will go up to $112 an hour. “Which is really high for trying to play a game for an hour,” said Ben Harper, president of the water polo club and a junior aerospace engineering major. A UB Athletics spokesperson did not immediately respond to The Spectrum’s inquires about what those rates would be. SA funds all of its 130-plus student clubs through a mandatory student activity fee of $104.75 a semester. Sport clubs’ budgets can range from high as men’s rugby’s $18,000 budget, to the swimming club’s $700 budget, depending on the club’s need, participation and status. Khan said SA pays for clubs’ trainers and insurance through its main $4 million budget line, so the majority of teams’ budgets go to paying league fees and coaching salaries. Most clubs need their members to pay team dues to cover all costs. She said additional fees for hosting games and tournaments would seriously threaten clubs’ ability to do so, and that UB should want its sport clubs to host tournaments with other schools because it brings recognition. Concerning the fees, Greene said students have to remember there are maintenance costs, and that any revenue generated through recreation is put back into recreation. Does ‘big-time’ athletics conflict with recreation? UB has competed in Division I of the NCAA since the early 90s. The football program reached Division I-AA status in 1993 and reached Football Bowl Subdivision, or Division I-A, in 1999. It was during this build-up that recreation became, according to one former UB recreation employee who asked to not be named, “the stepchild” of athletics in terms of adequate funding. Division I athletics administrators have to focus on their program, on selling tickets, on NCAA compliance, on generating exposure and above all, on winning. Hence, they automatically care less about providing top-notch recreation. Hutchins said it’s up to university administrators to tell UB Athletics that recreation is a key part of its operation. Perhaps, he suggested, the university should decide how much of the student athletic fee goes toward recreation. He doesn’t think UB administrators have told athletics not to worry about recreation, but, he said, it’s clear that no one in Capen Hall has insisted that recreation be prioritized as much as athletics. Several former UB recreation employees who spoke with The Spectrum said they had hoped UB would bring in someone with a recreation and physical education background when hiring its last two athletic directors. Both Greene and his predecessor Danny White had backgrounds mostly in college athletics and fundraising. “And a major part of this investment is student-athlete scholarships,” Tripathi said. UB Athletics spent $8,364,393 on student athletic aid for the 397 student-athletes receiving some kind of aid, according to its 2014-15 budget, which The Spectrum obtained via a Freedom of Information Law request. The athletics department used $2,944,794 of student athletic fee toward grant-in-aid, according to its fee expenditures. UB Athletics has worked hard to be “big-time” these past few years. White, who left UB in November to become the University of Central Florida’s athletic director, introduced the “New York Bulls Initiative” or NYBI in 2013 to, as he and the department put it, make UB “America’s next big-time college athletic brand.” UB announced the end of NYBI marketing last month and unveiled branding that more closely aligns with a new university-wide branding initiative. When asked how much the NYBI branding, both implementing and undoing, would cost UB Athletics, Greene said the branding fit right into money already allocated in the budget every year for new fields, courts and jerseys. USA Today reported that some schools use private organizations to fund large-scale branding. UB disclosed documents to USA Today that the UB Foundation, its private foundation that handles millions of dollars in donations, spent more than $142,000 on men’s basketball graphics and Alumni Arena’s new hall of fame wall. UB Athletics had five team MAC championships the past two seasons during the movement, including the men’s basketball team’s back-to-back NCAA Tournament appearances. University and athletics administrators like Tripathi and Greene – and pretty much all supporters of college athletics – stress that college athletics bring more attention to the academic aspects of the university, enhance the student experience and bring alumni together. Yet for programs like UB outside of the Power 5, the richest athletic conferences in the country, striving for “big-time” college athletics comes with a “big-time” subsidy. UB was second-most subsidized program by percentage (77 percent) in the 12-team MAC from 2010-14, according to data collected by The Huffington Post and The Chronicle of Higher Education. The data looked at 201 public universities that collectively spent more than $10 billion on Division I athletics. UB also received the second-most subsidies in the MAC during that time with $110,591,193. Only Eastern Michigan received more. UB ranked just ninth, however, in both the amount of money it collected from student fees and the percentage of its budget subsidized by student fees. About 68 percent – or $22.2 million of UB Athletics’ $32.1 million in revenue came from student fees and direct institutional support from the university, according to the department’s 2014-15 budget. Without student fees and direct institutional support, UB Athletics would have had a loss of $21,946,091 last school year. John Affleck, the Knight Chair in Sports Journalism and Society at Penn State who worked for the Associated Press for 22 years, said the universities that don’t rely on subsidies are “the Michigans, the Ohio States, the Penn States of the world” that have large TV contracts and ticket sales. According to its budget, UB Athletics made just $1.1 million in ticket sales and $142,500 in media rights, although TV revenue for MAC schools is expected to increase after a new deal with ESPN last year. “Those are the areas UB isn’t making the kind of money that it needs to make to be self-sustaining,” Affleck said. The 11 other universities in the MAC, however, all have a standalone recreational facility. Some of the MAC school’s rec centers feature amenities like rock walls, lazy rivers and golf simulators in addition to the traditional amenities like weight rooms and basketball courts. Other MAC schools have this despite making limited revenue and relying heavily on subsidies. Ten of the 12 programs were at least 69 percent subsidized, according to The Huffington Post and The Chronicle of Higher Education data. The difference between UB and its 11 conference rivals? The split between recreation and athletics. UB is the only MAC program responsible for overseeing its on-campus recreation services. Most universities, like the rest of the MAC, house their recreation services under a department like Student Affairs. Where does student fee money actually go? What does the roughly $700,000 of athletic fee money that goes into recreation actually pay for? Mostly student employees. Ninety-three percent of fee money allocated for recreation pays student personnel like gym monitors, lifeguards, intramural referees and team store employees, according to UB Athletics’ 2014-15 fee expenditures. The other seven percent, or $45,151, was spent on equipment. No student fee money went toward facility maintenance. UB students’ money mostly goes toward funding the football team. Football received $1,130,140 in student fee money last year – the most of any varsity team. That accounted for 15 percent of the team’s budget. Women’s basketball was second with $816,540. The football program spent the most of any UB team by breaking even with a budget of $7.2 million last year. But nearly 80 percent, or $5.7 million, of its budget came from student fees and direct institutional support from the university. Without support from the university and student fees, the team would have had a deficit of $5.7 million last reporting year. The team has also historically struggled. Since entering Division I-A in 1999, the football team has had just two winning seasons, including a MAC Championship in 2008. Although football got the most student money, women’s teams were funded with student fees double that of the men’s teams. The women received $4.8 million compared to men’s $2.4 million. Another $1.1 million of student fees were not designated to any specific team. Rec center or field house? In 2014, UB contracted Brailsford and Dunlavey, the same project management firm that consulted on the 2002 survey, to tour current recreational facilities, conduct student focus groups and develop a financial model for improving recreation on campus. The firm recommended that UB build a $80-million 265,000-square-foot student recreation center on North Campus, spend $16.4 million on renovating Clark Hall and build four outdoor recreation fields. There were also several options as to how those projects would come about, whether through UB or private construction. It is unclear how, if at all, a standalone recreation center would fit in with UB Athletics’ plan to build a new indoor field house. UB Athletics has been pushing to build such a facility for the past few years, as it is the only team in the MAC without one. Not having a field house puts its football program at a major disadvantage during the cold winter months, as it must practice outside in UB Stadium or make a nearly half-hour commute to the Buffalo Bills’ field house. When UB Athletics released its “Facilities Master Plan,” in February of 2014, it included plans for an on-campus field house, tennis center, baseball diamond and field for the soccer programs. It did not include any design for a student recreation center. Greene said a field house and recreation center should be separate facilities, as he doesn’t know of any sophisticated models that hold both, but that a field house would also help club and intramurals sports, not just the outdoor D-I programs. Greene said UB Athletics will soon submit a Request For Proposal so a few selected architects can submit their proposal of what a North Campus field house would look like. Greene would not disclose how much money UB Athletics currently has for the project, only saying the department still has money to raise. UB maintains its commitment to Division I athletics - including football. In recent weeks, students and faculty at Eastern Michigan released a report suggesting the school should drop football and move to a conference that does not require it. Khan, who will graduate this semester, said she hopes to be able return to campus as an alumna and see a standalone recreation center. 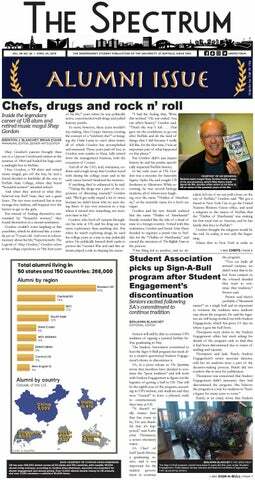 Tom Dinki is the editor in chief and can be reached at tom.dinki@ubspectrum.com. Follow him on Twitter at @tomdinki.